Your SDR spectrum man-made noise is a constant and distracting companion. Some call it noise, but it is really interference from nearby electronic devices and appliances. By now, most of you have discovered the downside of watching radio signals on your SDR. Man-made noise is everywhere. In some cases, the man-made interference is a pretty pure signal, like a birdie or carrier from your router. In other cases, the man-made noise is a combination of oscillations and spectral components emitted from a switched mode power supply. Before SDR, you would only tune one signal at a time. The only visual indication of that one signal was your S-meter. Noise would show itself as a higher base reading on the S-meter, typically S3 – S5. As you turned the tuning dial, you would hear whistles and pops, many of which were narrowband interference among the signals. Broader band noises would be a buzz or hash that might increase around certain frequencies. In the modern era of software defined radios, we can enjoy watching large chunks of spectrum maybe 100 – 500 kHz or 1-2 MHz wide. The good news is that we can see all the signals. However, the bad news, is that we can see all the noise and interference. On the left side of the picture above, you can see SDR spectrum man-made noise mixed in with regular signals. I took this picture on the 20 meter ham band. You can see normal SSB signals. Just above them is a carrier or birdie from my Samsung LED flat-screen, that will disappear when the TV is turned off. Just next to this is a collection of birdies from my neighbor’s network router that runs 20 hours a day. These birdies repeat themselves roughly every 50 kHz across the 20 meter band. Turning to the right side of the picture, and going lower in frequency, is the typical noise level on 40 meters. At 7 MHz, you expect a higher external noise level. But mixed in with the atmospheric noise is a collection of hash from multiple switched mode power supplies nearby. Typically, these are a mixture of oscillations from the free running oscillators in the SMPS, as well as diode-switching artifacts rich in 120 Hz harmonics. Fortunately, I can knock down some of these noises with my ANC-4 phasing unit or a coherent dual channel Afedri receiver. 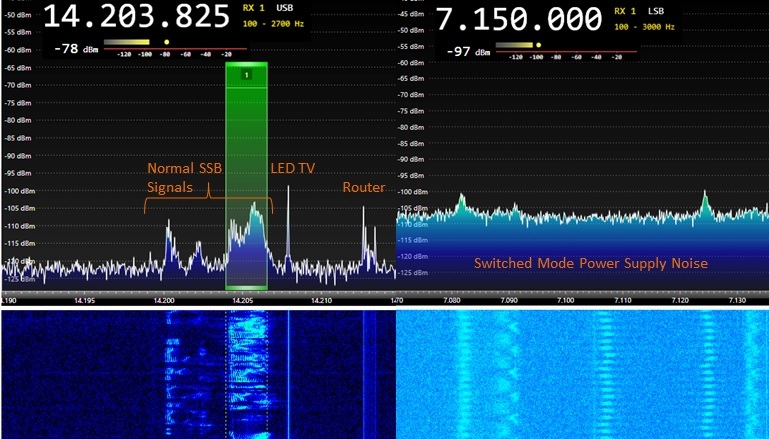 A low-power software defined radio is a great tool for tracking down and mitigating your local SDR spectrum man-made noise. You might want to set up your SDRPlay RSP2 and a netbook PC for portable use. The netbook battery has enough power to run both the computer and RSP2 for a few hours. Then, with a direction finding loop, or even a plain whip antenna, you have a person-portable diagnostic tool for local RFI. Quite often, you may find your sources of RFI closer to home, sometimes arising from computers, power supplies, monitors and poor connectors/cables right in your radio shack. I have mounted a mirror on the wall so I can walk behind my equipment desk and still see the spectrum display. This helps me quickly connect and disconnect things and immediately see any results on the monitor. Lastly, the SDR spectrum display does such a good job of showing RFI that it is possible to get fixated on the noise. Don’t let this drive you to distraction, or worse, OCD about noise. Learn to live with some of it. Remember that while annoying, much of the noise will only be around -120 to -110 dBm. Nothing is perfect.